Click on the banner to watch a snippet of NoseSecret on the Today Show with Kathie Lee & Hoda! Check out what fashion beauty gurus and other websites are saying about NoseSecret! Check out some of the most watched videos from Nosesecret customers! To watch more video testimonials or to check out what other people are saying, click here. (PRLEAP.COM) (NOSESECRET.COM) Fort Lee, NJ, October 15, 2008. NoseSecretTM, an innovative new product for improving the appearance of the nose, without the risks and expense of surgery, is now available for the first time in the United States. The NoseSecret corrector is a pair of flexible plastic splints that fit comfortably and invisibly inside the nose, gently creating the nose shape desired. Fabiola Diamond, President of NoseSecret states, "NoseSecret is as affordable as a department store cosmetic but its results can be as beneficial as a nose job. Studies of attractiveness show that a person’s nose should be in harmony with the rest of their face and NoseSecret is a quick and cost-effective approach to achieve this result. Our customers use NoseSecret for photo shoots, special occasions and any time they want to look their best. It is a time tested product and a favorite among actors and models from Los Angeles to Miami." 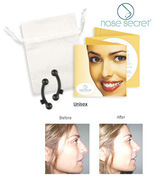 The introductory price of NoseSecret is $34.95 for 3 sets, which includes small, medium and large sizes to guarantee the best results for each customer. The product can be worn and removed as often as the wearer chooses. It is easy to insert and it improves one’s appearance while it’s worn. The NoseSecret corrector need only be removed for sleeping, swimming or other sports. For more before-and-after pictures, visit the NoseSecret website, showcasing NoseSecret as an alternative to nose surgery for both men and women. NoseSecret is dedicated to bringing the latest international beauty trends and innovations to our customers worldwide. We research the facts behind the fashion and uncover the beauty secrets of celebrities so men and women can look their best. Our corporate philosophy is simple: quality in our products and excellence in our customer service. For more information, visit www.nosesecret.com.